Spring is all about new beginnings. Flowers are blooming, trees are sprouting, windows are being opened to let fresh air inside, and schedules are hectic with a frenzy of new activities. But in the midst of all this activity, property owners across the country set aside time to take part in the ritual of spring-cleaning. According to the American Cleaning Institute, 72 percent of households spring clean every year. Chances are you are a participant in this annual event, too. But where do you begin? 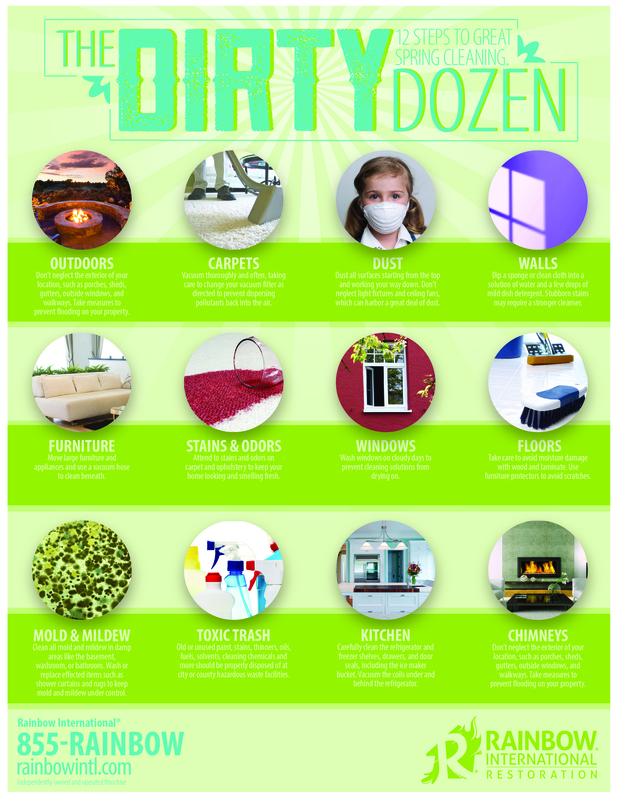 We have broken it down to the 12 key areas of spring-cleaning, or what we like to call “The Dirty Dozen”. Don’t neglect the exterior of your location, such as porches, sheds, gutters, outside windows, and walkways. Take measures to prevent flooding on your property. Vacuum thoroughly and often, taking care to change your vacuum filter as directed to prevent dispersing pollutants back into the air. Clean floors last. Dust and dirt from higher surfaces will fall and accumulate. The experts at Rainbow International recommend having carpets and area rugs professionally cleaned once or twice a year. Dust all surfaces starting from the top and working your way down. Don’t neglect light fixtures and ceiling fans, which can harbor a great deal of dust. Be certain light bulbs are cool to touch and your hands are dry! Clean or replace the air filter on your HVAC system to decrease the spread and buildup of dust, pollen, and other allergens as well. Dip a sponge or clean cloth into a solution of water and a few drops of mild dish detergent. Stubborn stains may require a stronger cleanser. Move large furniture and appliances and use a vacuum hose to clean beneath. Attend to stains and odors on carpet and upholstery to keep your home looking and smelling fresh. Professionally cleaning upholstery every 1-3 years and carpet once or twice a year can preserve items, keep them looking great, and maintain a clean and healthy indoor environment. Wash windows on cloudy days to prevent cleaning solutions from drying on. Use water and a microfiber cleaning cloth, or a solution of 1/4-cup rubbing alcohol with 1/3-cup vinegar in a 32-ounce spray bottle. While you’re at it, wipe down mirrors, frames, and other decor. Stained tile and grout can age your home. If it’s been more than three years or you have tough grout stains, the professionals at Rainbow International can help with a deep cleaning and sealing. Take care to avoid moisture damage with wood and laminate. Use furniture protectors to avoid scratches. Clean all mold and mildew in damp areas like the basement, washroom, or bathroom. Wash or replace effected items such as shower curtains and rugs to keep mold and mildew under control. If you have questions about mold, contact the professionals at Rainbow International so you can prevent the spread of mold spores, reduced air quality, and potential health issues. Old or unused paint, stains, thinners, oils, fuels, solvents, cleaning chemicals and more should be properly disposed of at city or county hazardous waste facilities. They are not only hazardous to your health, but often pose a fire risk as well. Don’t overlook chemicals in the garage, basement, storage sheds, and under sinks. Carefully clean the refrigerator and freezer shelves, drawers, and door seals, including the icemaker bucket. Vacuum the coils under and behind the refrigerator. Clean and degrease kitchen appliances inside and out. Wash all exterior surfaces. Hire a professional chimney sweep to clean and secure your chimney after winter. 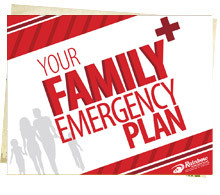 This ensures proper operation next season and reduces the likelihood of potentially deadly carbon monoxide exposure. Tip: Be sure to change the batteries in smoke and carbon monoxide detectors and perform safety checks for reliability. Overwhelmed by spring-cleaning? Professional cleaning services can make a huge difference for any property owner, whether home or business. Let the experts at Rainbow International help with spot and stain removal, odor removal; tile, grout, and hard surface cleaning; professional carpet care; pet stain removal; upholstery cleaning; mold remediation, and full-service reconstruction. Why Would You Dump Ice Water in Your Living Room?